Based on the much-loved and hugely successful memoir and stage play of the same name, 'Holding The Man' is the warm, funny and extraordinarily moving story of the 15-year love affair between Timothy Conigrave and the boy he fell in love with at high school, John Caleo. Tim was an aspiring actor. John, the captain of the school football team. Their relationship blossomed and endured in the face of everything life threw at it - pride, adversity, discrimination, temptation and loss - until the only problem that love couldn’t solve tried to destroy them. 'Holding The Man' stars Ryan Corr, Craig Stott, Guy Pearce, Anthony LaPaglia, Sarah Snook, Camilla Ah Kin and Kerry Fox, and is directed by Neil Armfield. The 'Holding The Man' competition has now closed. Winners will be announced shortly. Competition opens at 5pm AEDT on Sunday 10th January 2016 and closes at 11:59pm AEDT on Sunday 17th January 2016. Five winners will be chosen at random on Monday 18th January 2016. To successfully win, entrants must fulfil the above entry conditions before the time the competition closes. Current members/followers are eligible to enter the competition. Only one entry per person. Only one winner per household. To be a valid winner, the entrant must not have won a prize from SWITCH within the last 28 days. Each winner will receive one Blu-ray copy of 'Holding The Man'. By entering, you agree to receive occasional emails from SWITCH in the future. If you decide to unsubscribe from these updates, any further entries will not be applicable. Only Australian residents are eligible to enter. 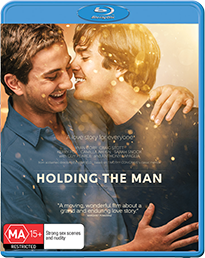 'Holding The Man' is available on Blu-ray, Digital and DVD on Thursday the 14th January 2016 from Transmission.